The Vow Exchange Turns 3! Earlier in May The Vow Exchange celebrated its 3rd year of spreading the love!! 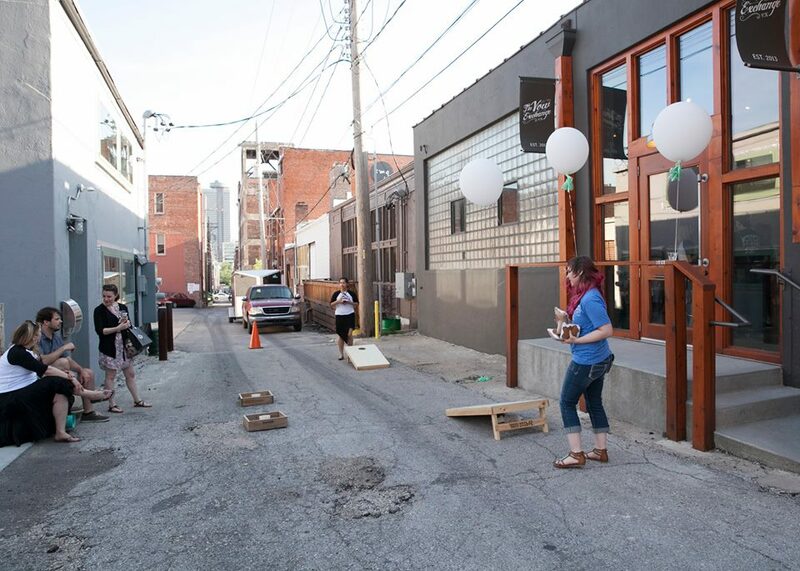 We had an awesome turn out on a busy 1st Friday down in The Kansas City Crossroads. We shared cake, champagne, swag bags and played PB&J themed tailgate toss as well as took silly pics with our new photo booth props! It was a perfect night to greet the dozens of guests who came including past couples who wed with us and new couples planning their big day with us soon. It was a truly unforgettable night. Here's to many more years of sharing love and this wonderful business called The Vow Exchange! Made by our resident Cakestress Nancy Stark! Yum! The VX got new initial banners for our couples! We gave out custom buttons "She's a keeper" & "He's a catch" as well as custom temp tattoos! We made custom PB&J tailgate toss bean bags! They are after all a perfect match! Our host Kristen laser focused on the game! Another new thing for our cake & champagne packages! Couples will have use of this super adorable photo booth prop kit! A few of the friendly faces here at The VX. They are the absolute BEST! And that's a PROMISE! These 2 ladies make The VX go. SO thrilled to have them on the team! A HUMONGOUS THANK YOU!! To all who came out to celebrate with us, you remind us why we love this business so. YOU are the BEST!